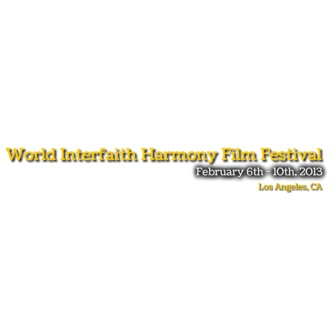 The World Interfaith Harmony Film Festival is an annual event to be observed during the first week of February in conjunction with the United Nations World Interfaith Harmony Week. World Interfaith Harmony Week was proclaimed by the United Nations General Assembly in October, 2010 as a resolution which points out that mutual understanding and inter-religious dialogue constitute important dimensions of a culture of peace. In the spirit of achieving a culture of peace, The World Interfaith Harmony Film Festival has been created to promote and celebrate harmony between all people regardless of their faith tradition or country of origin. Recognizing the imperative need for dialogue amongst different faiths and religions to enhance mutual understanding and cooperation, this film festival encourages a gathering of people from all across the United States and from nations around the World. We invite filmmakers from near and far to share their spiritually based film stories with us so that we may be inspired to learn from one another. The Festival Program will showcase and celebrate the works of independent filmmakers who strive to make a difference in our world by creating films on themes of peace, non-violence, social justice, and environmental balance as these themes pertain to interfaith harmony. The voices of young filmmakers will be an added highlight to our programming, in addition to traditional jury prizes awarded to filmmakers in feature length and short film dramatic and documentary competitions. We aim to contribute to a culture of peace through celebrating exceptional U.S. and International cinema, as well as through dialogue and programming which endeavors to enlighten and empower individuals, families, and communities to overcome the darkness of ignorance, conflict, violence, and divisiveness, and replace it with the light of communication, tolerance, understanding, and compassion..
2013 is the inaugural year of this annual International Film Festival of peace and good will. Address: 2701 N. Sepulveda Blvd.